Bulk Containers for Food Processing | Remcon Plastics, Inc. Process fruits, vegetables, sauces, and liquid food products without expensive steel containers. Our Tank on Pallet is engineered to store, handle, and discharge gravies, creams, sauces, eggs, oils, syrups, and other liquid food products. The lightweight, two-piece unit includes a polyethylene tank with lid set in a removable polyethylene base. Units fill from the top, discharge from the bottom, and smooth interior surfaces allow for fast material transfer and easy cleaning. Economical polyethylene saves money and is a long-lasting alternative to steel. Ideal for pickles, fruits, and other vegetables, our FDA-compliant, premium polyethylene, flat-bottom FBP bins come with a replaceable 4-way pallet. They are constructed with our exclusively-designed “R” lip with its rounded edges to resist cracking and perform for many years. Our most popular and the best value of our easy to clean, long-lasting, replaceable pallet bins. 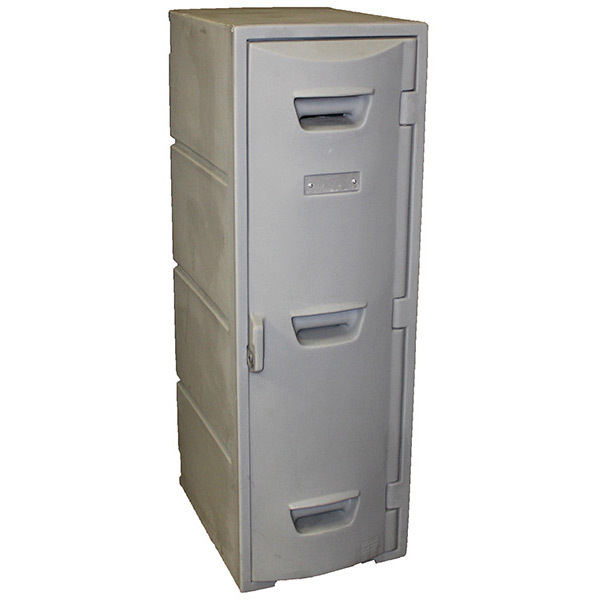 Durable polyethylene lockers are built to withstand the harshest environments and provide valuable benefits over steel. Our rugged rotomolded construction resists cracking, denting, and offers greater durability than inferior injection-molded counterparts. Unlike metal lockers, the doors close quietly without loud banging. Polyethylene will not rust like steel which makes them perfect for hot, humid, or particulate-free environments. They can be cleaned easily by simply hosing down with soap and water. See more solutions for the produce and food processing industry below. In 1991 Remcon developed the Tank on Pallet solution primarily for the cooked fruit business. It was for aseptic packaging of cooked fruit between fruit processors and yogurt and ice cream manufacturers. Used in conjunction with an aseptic bag, the Tank on Pallet provided a far less expensive alternative to stainless steel. Scott’s job is all about Continuous Improvement. Much like it sounds, that means Scott is always looking for efficiencies that will make our workers happier and more productive. Because people who enjoy their job take more care in what they do, which, ultimately, leads to better quality. And Scott really enjoys his job. He also enjoys playing soccer and coaching youth soccer. Which explains why we sometimes hear him yell “Gooooooaaaalll!” when he’s found a way to improve the work on the floor.